My daughter and her family lived in Seattle, land of cool, rainy days. They lived on the side of a mountain, realm of roaming deer. She has always loved to garden (wherever did she get that?) When they first moved to Seattle, she enjoyed seeing bambi and his momma visit. That is, until she discovered that everything she planted; perennials, annuals, and vegetables turned into deer browse. If you are having similar visits by hungry deer, there is a known “best” solution to keep them away from your prized flowers and shrubbery. Bobbex makes a deer repellent that does not wash off in the rain. This is critical to the effectiveness of a product if you live in a rainy climate or if you have plants under irrigation. You do have to reapply Bobbex repellent when new growth appears. The deer repellent made by the folks at Bobbex is an all-natural ingredient, environment-friendly product consisting of the scents of putrescent eggs, garlic, fish, clove oil, vinegar, and others. Not only is the smell a deterrent, so is the taste. It dries clear and will not burn plant material. In fact, it will work as a fertilizer as it breaks down in the environment. A reapplication of Bobbex every couple of weeks during rapid springtime plant growth and twice-a-month spray period in winter, as the temperature will permit (above freezing), will keep bambi and his relatives at bay. “For the past 22 years, Bobbex has been committed to producing and providing consumers with a safe, natural, proven effective foliar spray repellent to (successfully) keep deer away from residential and commercial landscaping, offering consumers a viable solution to control deer damage,” says Greg Ecsedy, President of Bobbex Inc.
Spray Bobbex in one smooth motion, spreading an even coat without over spraying or causing dripping, which is wasteful. Spray on dry surfaces of the leaves and twigs. Be mindful of windy days or risk being deer repellent yourself. Allow for 5-6 hours of dry time in humid climates and 3 hours in arid climates. Dry time is critical to the sticker in the product setting up and being water insoluble. 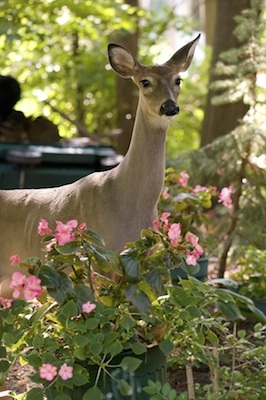 Know how your shrubs rank in deer eating preference. Shrubs that are seldom eaten during non-stress times can be sprayed less often. Spray conservatively with a pump pressure sprayer until the first drip appears. Spray in the early part of spring season to try to disrupt the deer browsing patterns. They may find greener pastures elsewhere. New growth is unprotected growth. Spray the entire shrub, and then as the shrub grows during the season spray it after every 2” of new growth. The base portion of the shrub may not need as many applications. Greg Ecsedy, President Bobbex Inc.
GardenSMART has received products and backing from Bobbex Inc. and has found Bobbex Deer Repellent works well in our own garden.